This workshop on data visualization might be of interest to a lot of you. I wish I could just hop over the pond. This entry was posted in Statistics & Methodology, statistics/R, workshop and tagged AMVL, R, Tuebingen, visualization, workshop. 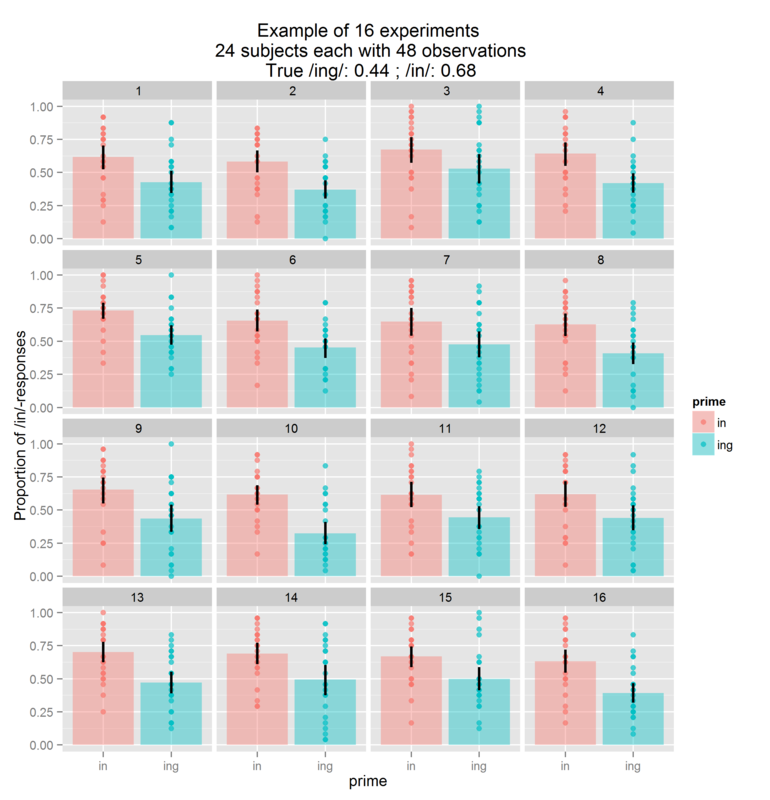 Thanks to some recently developed tools, it’s becoming very convenient to do full Bayesian inference for generalized linear mixed-effects models. First, Andrew Gelman et al. have developed Stan, a general-purpose sampler (like BUGS/JAGS) with a nice R interface which samples from models with correlated parameters much more efficiently than BUGS/JAGS. Second, Richard McElreath has written glmer2stan, an R package that essentially provides a drop-in replacement for the lmer command that runs Stan on a generalized linear mixed-effects model specified with a lme4-style model formula. Read on for more about the advantage of this approach and how to use it. This entry was posted in Software, Statistics & Methodology, statistics/R and tagged Bayesian statistics, glmer2stan, lme4, mixed effects models, R, stan. I gave a short tutorial [pdf slides] at the LSA summer institute on one of my favorite R packages: plyr (another brilliant Hadley Wickham creation). This package provides a set of very nice and semantically clean functions for exploring and manipulating data. The basic process that these functions carry out is to split data up in some way, do something to each piece, and then combine the results from each piece back together again. There are lots more examples (as well as more background on functional programming in general and the other use cases for plyr) in the slides [pdf] (knitr source is here, too). This entry was posted in Software, statistics/R and tagged knitr, plyr, R, slides, software, statistics, tutorial. Knitr is a great way to combine document markup (Latex, Markdown, HTML, etc.) with R code for data analysis and visualization. It pulls out the chunks of R code, runs them, and re-inserts the results into the document source (usually a .tex file), which can then be compiled as usual. Normally you would call it from an R console (or use something like RStudio), but what if you want to call it from the command line, like latex? Here’s a little shell script that I use to automate the knitting of .Rnw files (combining R and Latex): knit.sh. This would produce awesomefile.pdf (as well as the intermediate file awesomefile.tex, and the extracted R commands, awesomefile.R). You might even rename the script as knit and put it somewhere on your search path (maybe /usr/local/bin/) to be even more fancy. This entry was posted in Statistics & Methodology, statistics/R and tagged knitr, latex, R.